Six local chefs from Central Pennsylvania�s finest dining establishments will compete for the Boalsburg Farmers Market Fifth Annual Golden Basket Award on Tuesday, Aug. 4. This event is held by the Boalsburg Farmers Market and is part of PASA�s (Pennsylvania Association for Sustainable Agriculture) �Local Foods Week�. The event features chefs preparing a main dish and two sides from ingredients produced by Boalsburg Farmers Market vendors. The chefs gather their ingredients at the market, then prepare their plates for submission to the judges in front of market guests. The chefs have only 45 minutes to assemble the dishes. After the judges have tasted and scored all of the chef�s offerings, an awards ceremony is held to announce the new Golden Basket winner. 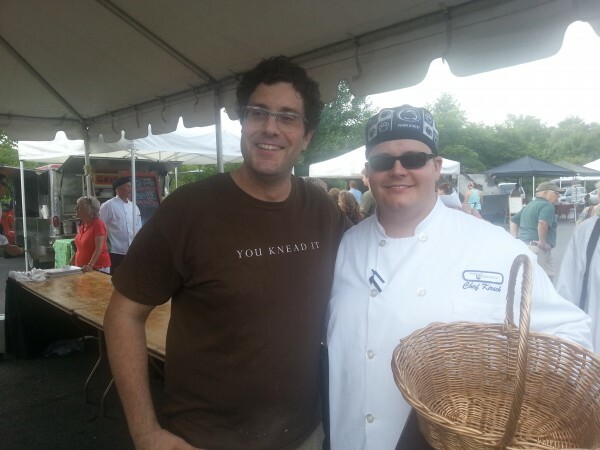 Last year Chef Kirsch from the Nittany Lion Inn took home the Golden Basket. Come out and see if he is able to hold onto the title. The event begins at 2:00 p.m. and ends at 4:30 p.m. at the Tuesday, Aug. 4 Boalsburg Farmers Market at the Pennsylvania Military Museum, Business Route 322, Boalsburg. There is ample, convenient free parking for the event at the market. In addition to being fun, the competition aims: to support and showcase our local farms and producers; to let the public see firsthand how to utilize the food they can buy at the market; and to promote and encourage shopping at the farmers market. Participating chefs are: Kirsch McMaster (Nittany Lion Inn), Jeremiah McClanahan (Fasta Pasta), Mike Benjamin (Benjamin’s Catering), Harrison Schailey (Harrison’s), John Clickner (Gigi’s), and Erin Snyder (Elk Creek). Judges for the event are State College Mayor Elizabeth Goreham, Kevin Kassab, director of State College’s Department of Health, Jamie Oberdick of WPSU�s Local Food Journey, local food writer Michele Marchetti, Kate Delano, editor of State College Magazine, and Vilma Shu Danz, food writer for Town and Gown.